We are turning into a bit of a Bollywood / Bhangra Specialist these days with the ever increasing number of English / Indian weddings we are playing at across London & the South East. Indian weddings are also an extremely big business at one of our partner venues, Addington Palace in Surrey …where we had a big part to play in the huge wedding of Deepali & Chris last November …as a result of the media captured at that event we have gone on to play at many mixed weddings throughout 2015. Our recent run of events saw us at Kerrie & Hardeep’s wedding at Offley Place in Hertfordshire (Oct 31), the couple booked our Uplighting Package + First Dance Cam Upgrade (Option 2) …then last Saturday (Nov 7) we were at Houchins Farm in Colchester for Jennie & Ricky’s wedding. We conclude our recent run with a Bollywood Themed Parents Event at Saint Ronan’s School in Hawkhurst, Kent this Saturday (Nov 14). Sometimes during the planning process it is a concern for brides planning English / Indian Weddings as to how it will all work with the music. We have a lot of experience bringing these events together and my advice would be not to try and stage things too much and just let the evening unfold naturally …having said that I would give you the following tips. 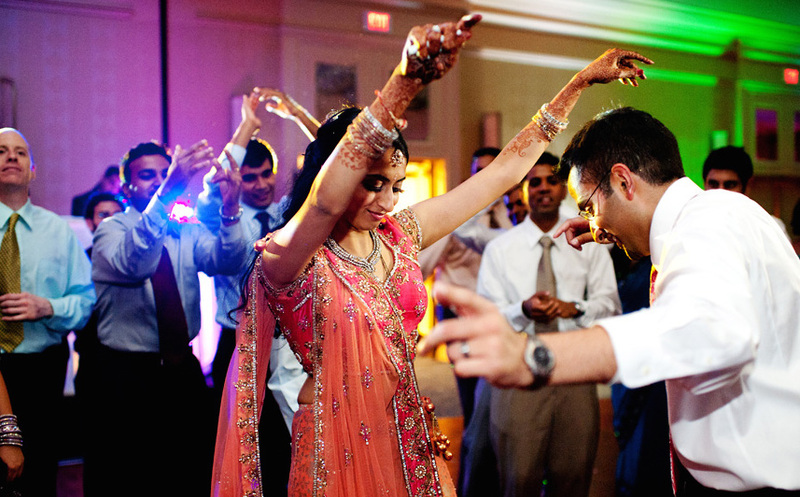 In our experience if your Indian guests make up a large percentage of the crowd and particularly if they have travelled over for the wedding I would highly recommend that a large amount of Bhangra and Bollywood style music is in the music library (even if it isn’t all played its good to have it). We do already stock a large amount of Bhangra, however you are also more than welcome to provide your own tracks. Indian Weddings are full of colour and extremely vibrant, go for our Uplighting package and colour theme your event for the maximum experience …add even more wow factor by adding a Starlit Dance Floor. Make the Indian guests feel extra welcome …do this by incorporating a set of music quite close to the first dance and get the Bhangra out there early on, its important to get any event off to a roaring start and this will drive your Indian guests straight to the floor, don’t worry too much about the English guests …the majority are always more than happy to get involved and experience something new. The success of any mixed race wedding is determined by playing the correct fusion of music at the correct time …like every event in the wedding industry, you need to know your crowd and when to please them.